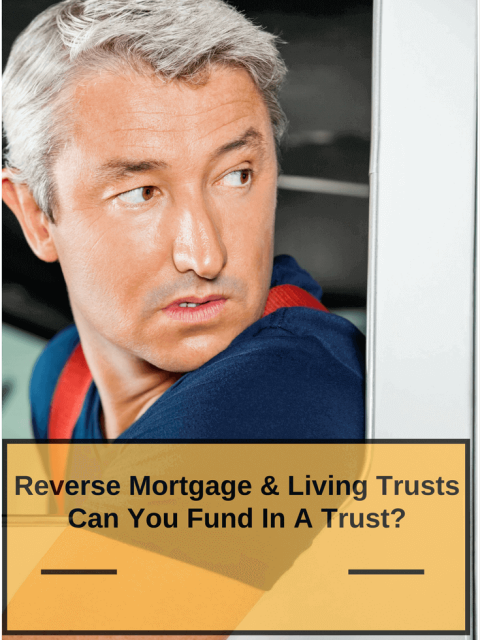 Home » allow you to fund » Reverse Mortgage and Living Trusts – Can You Fund in A Trust? Reverse Mortgage and Living Trusts: A very common question about reverse mortgage is “can you fund in a trust?” Is your home in a trust? Are you pondering getting a reverse mortgage? If so, here are the basics pertaining to reverse loans and living trusts. Usually, when you do a regular loan, the bank wants you to deed your home out of the trust. Then, after the loan funds, you can put it back in a trust. That’s not necessary in the reverse mortgage world. You can actually keep your home in the trust when your new loan is funded. What Kind of Trusts are Ineligible? Irrevocable trusts are historically not eligible. However, some lenders will allow you to fund in an irrevocable trust on an exception basis. An irrevocable trust is one that cannot be changed or cancelled without the consent of the beneficiary once it is set up. This type of trust is an arrangement in which the grantor permanently departs with the ownership and control of the property. If your home is in this type of trust, the lender may not allow you to fund in this type of trust. Again, it’s generally done on an exception basis. Are There Other Options if My Home Is In An Irrevocable Trust? Yes, there are other options. Often times you can take your home out of the trust and then get a reverse mortgage. What Kind of Trusts Are Eligible? Generally, most revocable trusts are eligible (but not all) and you can usually fund a reverse mortgage in a revocable trust. However, some state restrictions may apply. Further, the trust will have to be approved by a neutral 3rd party. An attorney will issue an attorney opinion letter stating whether the trust satisfies the requirements of Paragraph 45 of HUD Handbook 4235 (Rev.-1) dated November 18, 1994. The cost for that is pretty minimal. A revocable trust is created by an individual during his lifetime and can be changed or cancelled during his lifetime. The trust can also be changed or cancelled for any reason during this person’s lifetime. The trustee is normally the same person as the grantor. This sort of trust is typically known as a revocable inter-vivo trust. If your preference is to fund your reverse mortgage in a trust, here’s what you should be prepared for. Provide a copy of the complete trust. Closing costs will be slightly higher due to the trust review. It’s not too bad though. Generally, the cost is from $125 – $250 more than normal. ****notice, the info provided is for informational purposes and should not be construed as legal advice.